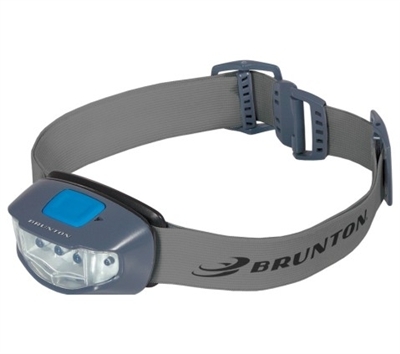 Brunton Glacier 69 – High Efficiency Headlamp. Measures 2 3/8″ x 1 1/2″ x 1 5/8″. Black and gray composition housing with push button on/off switch. White Nichia LEDs. 30 lumens. Infinite dimming, power saving green light and dispersed reading light modes. Power management system for extended runtime. Power lock-out mode prevents accidental discharge. SOS flash, on-board battery life indicator. Beam distance: up to 69ft on high. Runtime: up to 80hrs. Gray and black neoprene adjustable head strap. Uses three AAA batteries (included). Hang packaged.